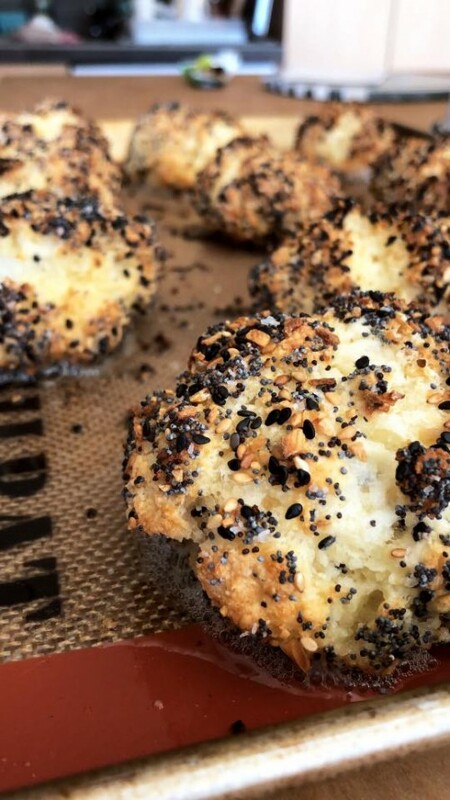 gluten free biscuits rolled in “Everything” was posted on January 13th, 2018 at 1.57pm and is filed under recipes..
I’ve been loving cooking through Smitten Kitchen’s Every Day book. Here’s my gluten-free take on her everything drop biscuits. Smitten Kitchen Everything mix, tweaked slightly. Preheat oven to 450º. Mix the Cup4Cup, baking powder, baking soda and salt together. With a pastry blender, cut in the butter until nothing is bigger than a pea. Stir in the milk and mix until it just comes together. Drop 10 similar sized rough mounds of dough, one at a time, into the Everything mixture and roll to coat. Transfer to a lined baking sheet and flatten slightly. Bake for about 12 minutes, or until golden brown. When you remove them from the oven, there will be extra butter pooling around the biscuits. This is what makes them so good! Just let the biscuits cool on the baking sheet slightly and they will reabsorb most of the butter. *Note: If you want to roll these biscuits out and cut into circles, decrease the milk to 2/3 cup.